It’s late afternoon and the heat has gone out of the day. Tea has been served and the safari vehicles are beginning to drift out into the wilderness for the early-evening game drives. Experiences have been exchanged amongst the guests as to who has seen what. Some have ticked off all the members of the ‘big five’ – lion, rhino, buffalo, leopard and elephant. Some have only just begun. We fall into the latter category and we’re particularly keen on seeing a lion. But, since big beasts can’t exactly be ordered off the safari menu, we’ll be happy with whatever we see. Philip points to the river, which snakes alongside us. It’s a muddy-brown colour and overhung by trees. There are whirling eddies in the water, but no sign of hippos. Until, that is, you look more closely. Then you see the round raspberry-pink ears and the long mud-brown snouts, and you hear their deep honking, interspersed with huge wheezes, it sounds as if some giant creature is laughing at something incredibly funny. Which maybe it is: us. Philip tells us that hippos spend most of their time in the river, resting and socializing, typically emerging only at night to forage for grass, of which they consume an incredible 40 kilos each per night. Sometimes, he tells us, they walk up to six miles to find sufficiently short and succulent grass. As we watch, an enormous head emerges from the water and splits open into a pink-lined yawn set with huge, ivory-yellow pointed teeth. As if on cue, all the hippos rise from the water to survey us. One has a coronet of weeds on its head, and then they sink below the water again. Letting in the clutch slowly, Philip rolls the heavy vehicle on, and herein lies the magic of the game drive – you have no idea what you are going to see or when you are going to see it. It’s a voyage of discovery, with all to play for. As if on cue Philip points at a tree we’re about to pass. ‘See the leopard’s larder?’ he asks. In the fork of the tree, draped over a branch like a wet rag, is the carcass of a young wildebeest. ’The leopard will return for it later,’ says Philip, ‘unless it has caught another this morning.’ He goes on to explain that the wildebeest are calving on the Conservancy. It’s all part of the Conservancy’s own private migration, the Loita Migration, which takes place independently of the main migration, which traditionally happens between August and October. The sun is beginning to drop in the sky and great shafts of silver light fan out above the escarpment. We pass a hyena sitting in a pool of water. He eyes us suspiciously, but makes no move to leave. ‘Refrigerator,’ says Philip, ‘he’s got a wildebeest calf in there, but he’s keeping it cool.’ We look closer, and sure enough the tiny carcass can be made out below the water. 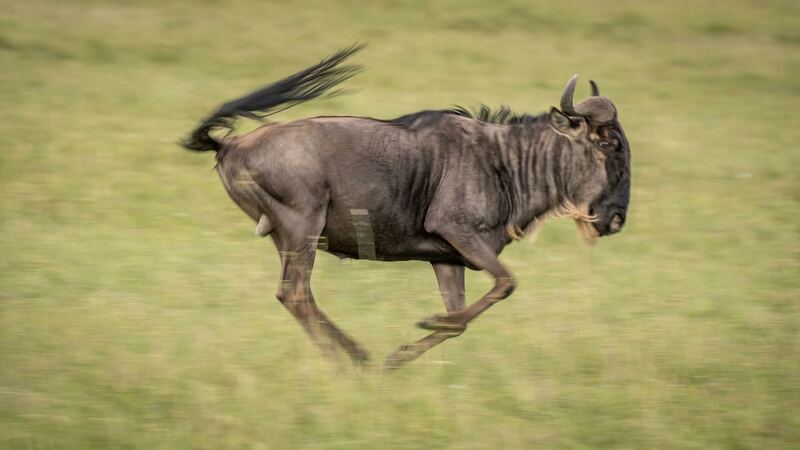 The wildebeest, it seems, are unwillingly, providing food for all. It’s sad, but its also part of the great chain of life and death that is the wilderness. We’re traversing a small valley, and there’s a couple of old buffalo meandering through the low, spikey acacia shrub that is a feature of the Conservancy. Something large, golden and very still is lying in the bottom of the little glade. Philip laughs when we say this. ‘Better not go and investigate then’, he says, ‘because that’s a lion and it’s definitely not dead, just very full.’ We look closer. The lion is lying on his back, his great paws clutched around his snout and his head pillowed on a bush. His back legs are splayed and his white underbelly exposed. He looks like a giant kitten sprawled on a cushion. We train our binoculars on him. Clouds of flies buzz around his tawny mane, his mouth is slightly open. A pink tongue tip protrudes. ‘The pride must be near,’ says Philip, ‘let’s go and find them.’ We don’t have far to go: a few hundred meters away, on a stretch of khaki-coloured open ground above the river lie two lionesses. One is suckling her three cubs. The other is sleeping, and a pair of older cubs scramble over her. They’re mock fighting, batting each other with tiny paws and snarling to show miniature teeth. 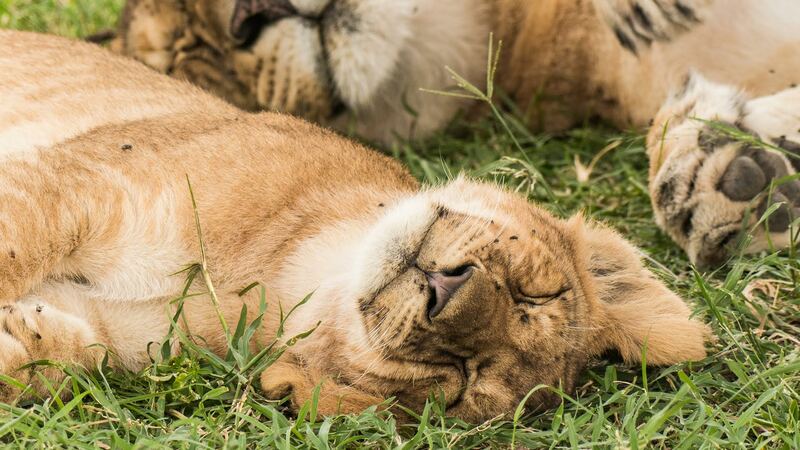 None of the lions pay us any attention, It’s as if we’re not there. ‘Do you see the other lion?’ asks Philip. You’d think a lion would be hard to miss, but he’s lying in the longer savannah grass and it’s only the motion of his mane moving slightly in the breeze that reveals his position. As we watch, he rises to his feet, yawns, swings his dark-brown tasseled tail to and fro and walks towards our vehicle. But Philip is not alarmed. ‘Just checking us out,’ he says. The lion comes closer, sniffs the air and then turns away. For a split second we engage his amber stare. Then he stalks languidly away into the long grass and, without warning, flops down, puts his nose on his paws and goes to sleep. We stay beside the pride for another fifteen minutes or so, just watching and marveling. It’s not until you see a lion in the wild that you appreciate how large it is: and how very beautiful. And it’s not until you find yourself so close to a lion that the ancient race memories resurface in your brain. Then you feel a very raw, very basic, very real gut-wrenching FEAR. There is silence in the vehicle on the way back to the camp: an awed silence. We asked for lions and we got them. But the experience was much more profound than we had expected. We had come upon them so suddenly, so naturally. We had been permitted to observe them so closely: so intimately, And we had had them all to ourselves. 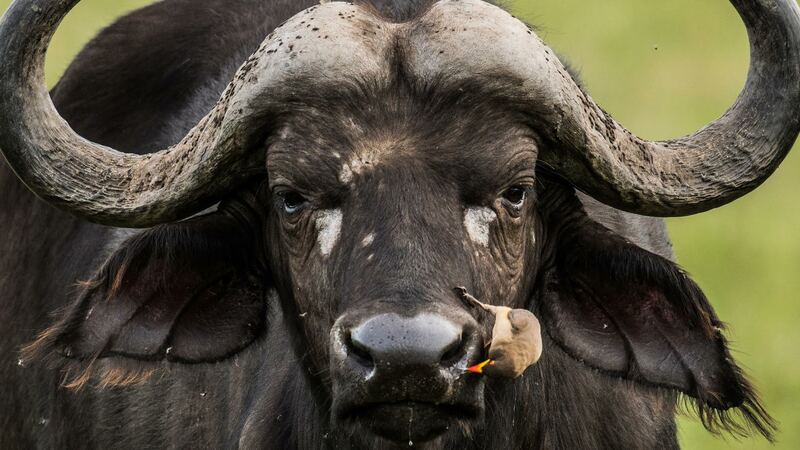 But that’s the magic of the Olare Motorogi Conservancy: it’s primeval Africa. Africa as it used to be. No pop-up top mini vans, no clusters of vehicles around the lions. Just you and the wilderness. It’s exactly how it should be.